It is fitting that New York City's Library Walk has a plaque honoring Muriel Rukeyser. New York City was home to her birth and it is where she breathed her last in 1980. In between, Muriel Rukeyser raised cane poetically against the injustices of war, racism and inequalities affecting humankind. 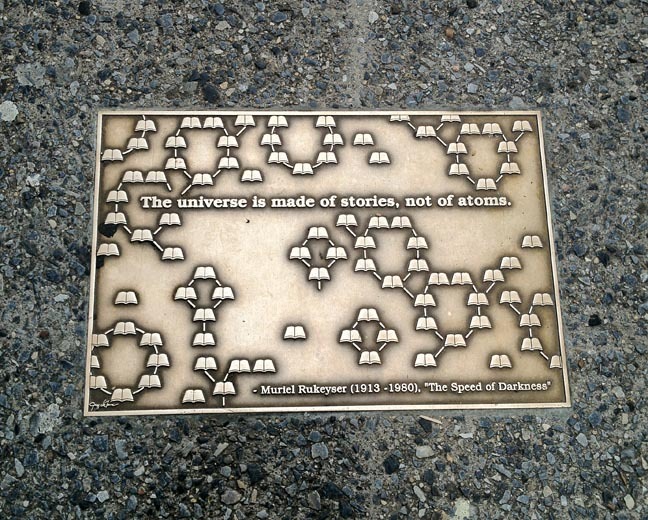 On the occasion of the 100th anniversary of Muriel Rukeyser's birth — December 15, 1913 — we visit Library Walk and the poem — The Speed of Darkness — that is quoted upon her plaque. Published at the height of the Viet Nam War in 1968, The Speed of Darkness: Poems was Muriel Rukeyser's 15th published volume of poetry. Her first volume, Theory of Flight from 1935 won Rukeyser the coveted Yale Series of Younger Poets Competition. Rukeyser's poetry was defined by her sense of justice and much of her poetry could be read as documentaries of her times and experiences from New York's Seventh Avenue to South Korea. That sense of justice is reflected in one of her last poems — The Gates — written in support of the imprisoned Korean poet Kim Chi Ha.